- with the quality and perfection this entails. Here you will not find any quick solutions which causes variations, margins for error nor approximations. It is solid craftmannship tru and tru a technological masterpiece - no box which causes compressions, standing waves of phaseshifts. The dipolar design delivers an icepick sharp impulseresponse all over the register. Magnestatic elements in the top of the dipole gives an open, transparent and intimate sound experience. Forsman VSS5 will pay justice to any recording. With an intricate level of details seldom experienced. Dipol speakers play with the acoustics of the room, without adding own resonances or colorations. The crossover is phase correct and clear. The organic form of the gap models a realistic soundscape over the whole frequency range. Without edge resonances and standing waves. VSS5 is especially suited to reproducing realistic and complex soundscapes in large rooms. We will not spill all the beans, but in line with the magnetostatic elements in the midrange tweeter, the dipolar magnetostat delivers an ultra clear reproduction. The crystal clear but still realistic reproduction topps the soundscaape and leaves the same feeling like when you have been at a really great concert. You just want to hear more. 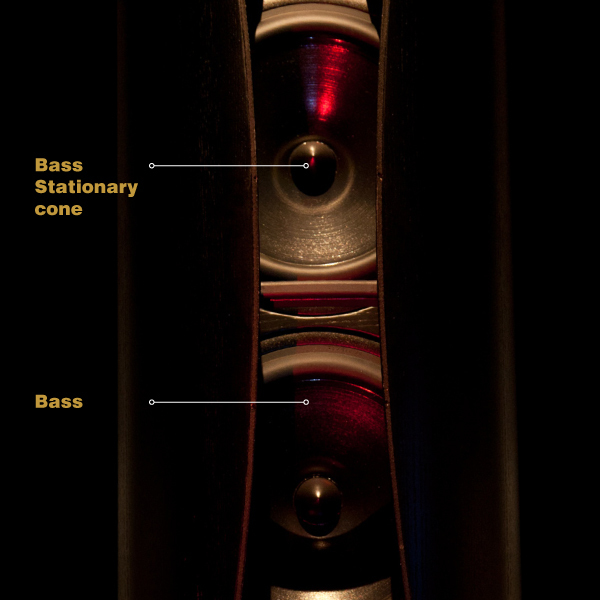 All bass elements have a phase plug in the center that is stuck in the drive of the bass elements. 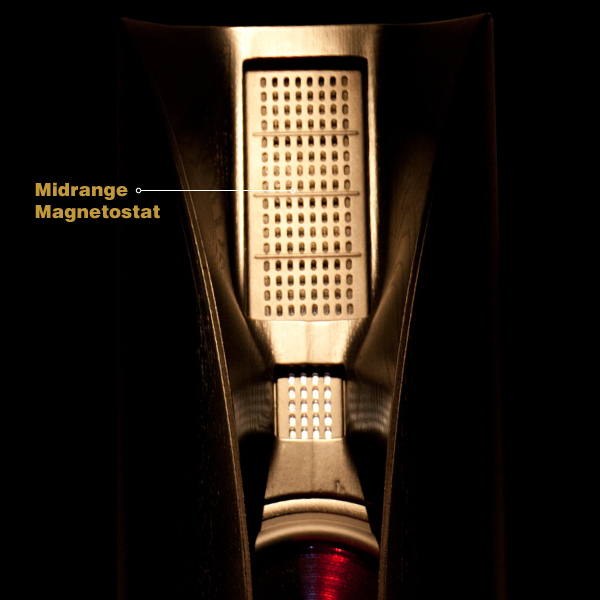 This phase plug eliminates air from the center of the bass elements passing through the magnet. This removes the cause of airflow noises you can get from traditional elements when the air is forced through a center hole of the magnet and is blown out like that what happens in a bass port. Again, the gain is detailed, crystal clear, accurate reproduction without distracting airflow sounds. 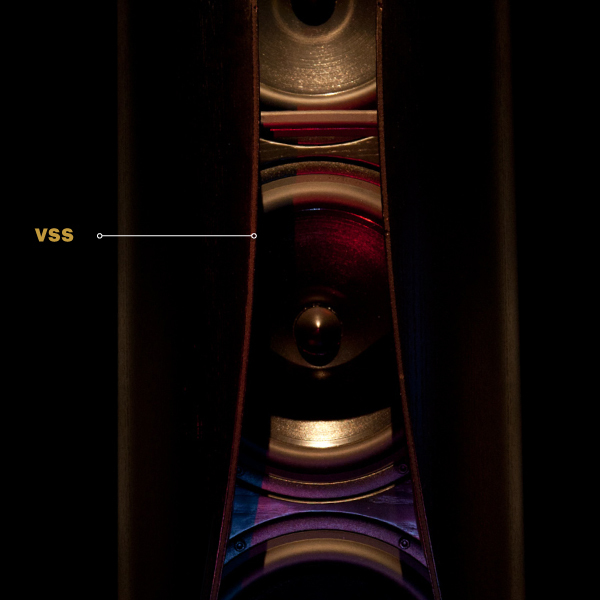 The inside of the vertical split of VSS5 is a masterpiece in itself. All surfaces are organic and designed for maximum adaption of the frequency distribution areas. 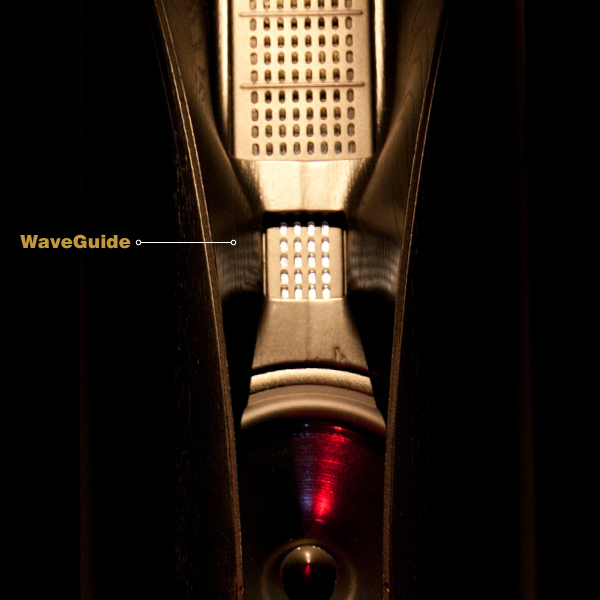 The curves are smoothing out the extent of the speaker elements and provides a seamless integration of all frequencies. The resulting ultra-high-resolution velocity through the frequency spectrum is unique and provides a listening experience that is almost unheard of. Based on our patented Vertical Split System, we have researched, drawn and listened to a result which is our new top model taking over from the VSS Ultima. 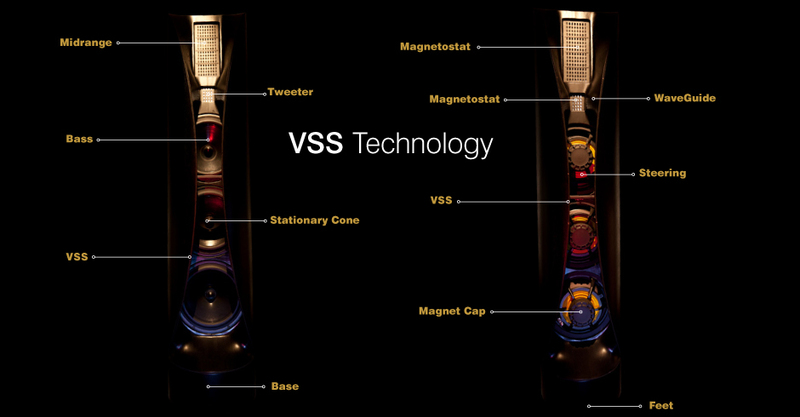 Just like the car industry and Formula One, our aim was to achieve perfection first , then we took some new discoveries and transformed these in the models VSS4 and D2. However, back to VSS5: Staves made from the finest furniture quality wood are glued together in an interlocking manner, then it is carved by a CRT drill to achieve its final form in a 5 aksis datadriven drill. This results in a light and sounddead construction. The elements are mounted on a laser cut centerplate in solid aluminium. The cabinet is handpolished and lacquered 10 times with a two-component lightresistive varnish. The interior and furniture designer Anne Cecillie Hopstock is responsible for the visual design. With its timeless apperance this speaker is easy to place in any home. Having both functionality and good looks on its side, it is a pure joy for the eye. 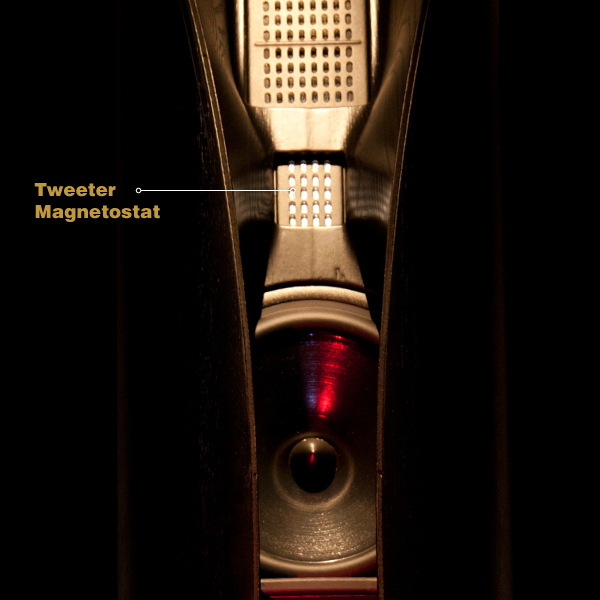 The magnet is protected by a rubber-cover which prohibits airflow in creating a "whisteling" sound around the magnet. The rounded edges and forms adds to reducing the last bit of margin for error. Even the tiniest little details have been scrutinised and considered in great detail. 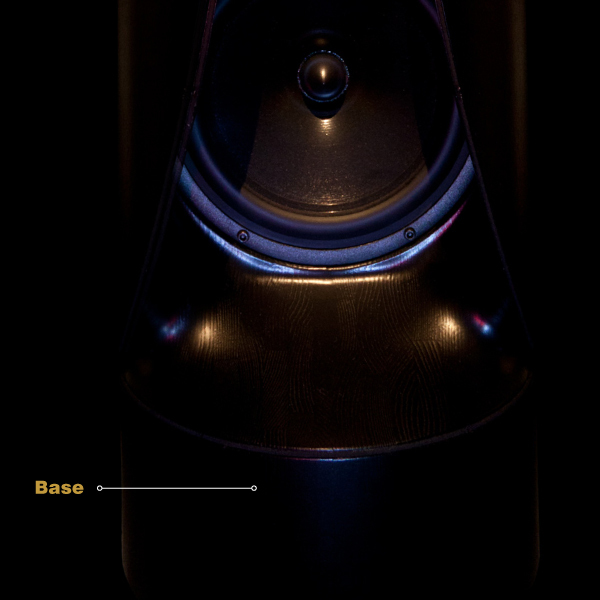 Every Forsman speaker has several bass elements. VSS5 3 x 10 inch, VSS4 3 x 8 inch, D2/8 2 x 8 inch og D2/10 2 x 10 inch. Right from the beginning Forsman have been using elements produced on a larger scale. In todays products you will find elements which all have been produced to Forsmans unique design and specifications. The production of the elements is taking place at world-reknowned SEAS, which coincidentally is just on the other side of the fjord. In SEAS Forsman has found an exceptional partner - a working relation and development on par with in-house production. Magnetostatic element for the midrange. Forsman uses tried and tested magnetostat elements. These elements reproduce the impulses clearly and with a sence of air. With these the reproduction of artists song sounds as if the tones emenates directly from the vocal cords. Acoustical instruments are so close to being realistic that the listener feels he can almost touch them. 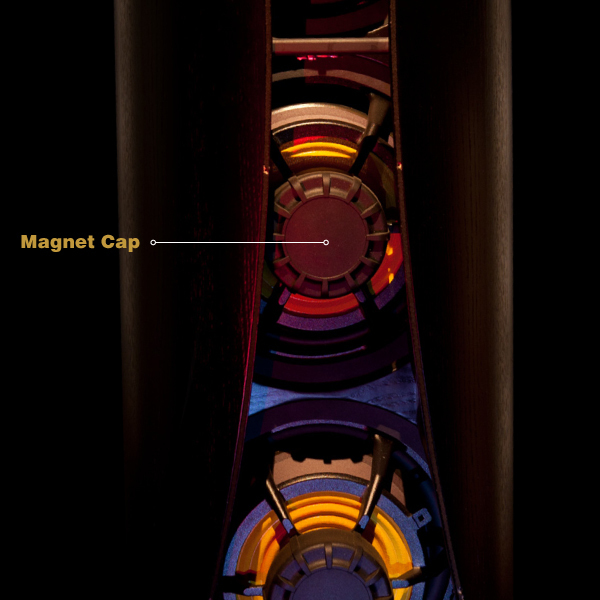 The elements has a spider (the yellow kevlar outer membrane) which guides the coil correctly in relation to the magnet. This ensures that the main membrane moves safely, freely and gently in tandem with the signalpulses it has to disseminate. 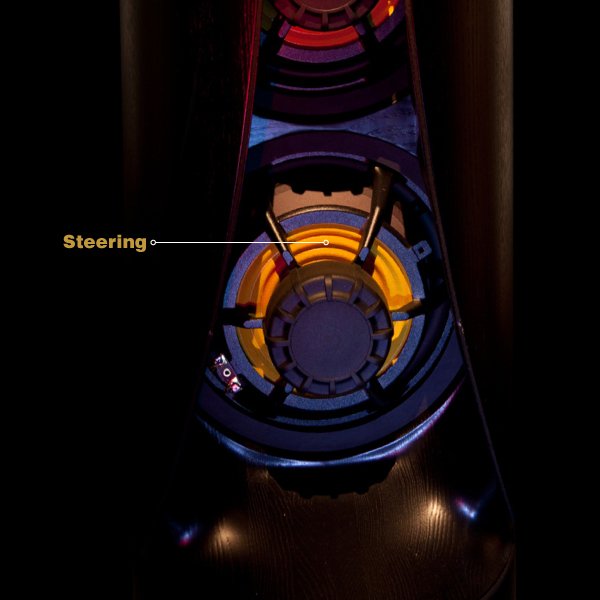 The crossover in Forsmans speakers are especially designed for dipole speakers. We have developed a unique expertise around crossover theory and dipoles, which we use in all our speakers. The crossovers are designed in a manner so the end result is homogenic rolloff, timing and correct phase transitions and homogenic spreading of resulting sound impression. The last part is extremely important for the listening experience. It does not help anything if the elements are in phase at the crossover at -6db, they also have to be in phase 1 octave above and 1 octave below, measured in the real listeningposition. Every component is measured to satisfy the demand to linearity in the specific frequency ranges for which they are utilized. Impedance matching is done for the bass elements with a proprietary primary inductance with three parallel conductors. The circuit board on which the crossover is mounted is of double thickness and fasteners have been situated so that they dampen the resonances the most. Terminal connections go right into the crossover without wires or other connection points inbetween. Forsmans speakers stand surefooted on feet we developed ourselves. They consist of several individual parts. The main housing is cut from POM in the shape of a cylinder together with the piston which is in contact with the floor. Between the housing and the piston, there are several layers of rubber seals and a specially developed substance which prohibits transference of sound and vibrations.